BBQ Chicken Tacos are everyone’s favorite healthy and easy dinner at our house! Marinated bbq chicken is served in a warm tortilla topped with black beans, corn, onion, cilantro, avocado and a creamy cilantro lime sauce. If there’s one type of meal we have on repeat each week, it’s tacos. Everyone in my family loves tacos, and I love how versatile they are. I have several different taco recipes and we love each one for different reasons. Sometimes I make a side of our favorite Mexican rice to go with tacos, but it’s not even necessary with this recipe. 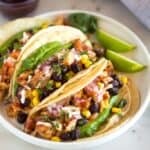 These bbq chicken tacos are full of healthy and delicious toppings that will keep you full, and the ingredients are hopefully simple enough that you don’t even need to run to the grocery store. These bbq chicken tacos are really easy to make and perfect for a casual summer dinner, or easy weeknight meal. 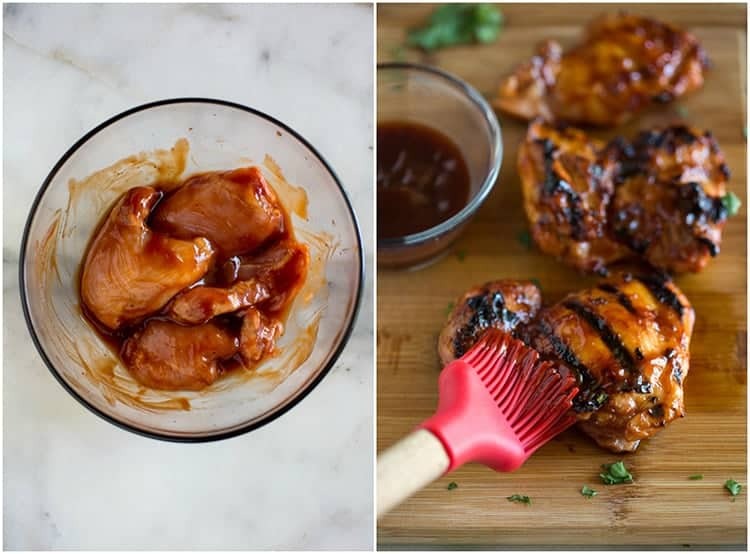 Just marinate the chicken in your favorite bbq sauce and cook it on the grill, or in a hot skillet, if you’d rather. The chicken is done when it’s no longer pink inside, and reaches a temperature of 165 degrees. Chicken thighs may take a few minutes longer to cook than chicken breasts. Be sure to allow it to rest for a few minutes before chopping it up to serve with tacos. If you are going to grill your chicken, I highly suggest using chicken thighs, instead of breasts. Chicken thighs (dark meat) are more forgiving on the grill and wont dry out as easily as chicken breasts, thanks to their higher fat content. 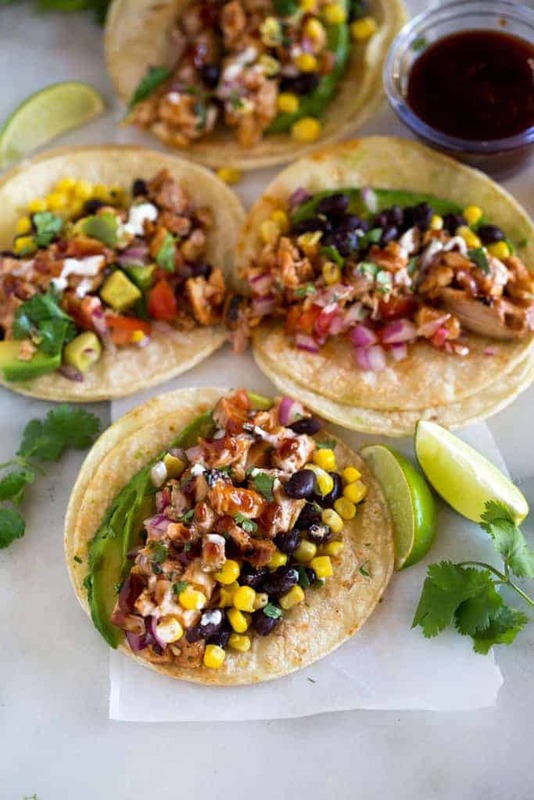 To prepare your tacos, add cooked, chopped chicken, corn, black beans, tomatoes and avocado to a warm tortilla. Drizzle extra bbq sauce and cilantro lime sauce on top. The best way to heat corn tortillas is in a skillet on the stove, or on the grill. Cook them for just a few seconds on each side, until small golden spots appear. Transfer them to a plate and cover, or wrap them with tinfoil to keep warm. Stack them as you go, making sure to re-cover them after each addition. I don’t recommend using the microwave to warm corn tortillas because they will be softer and flimsy, and may fall apart when you make your tacos. This recipe is really easy to adapt if you don’t have what you need. Swap pinto beans for black beans, and add additional vegetables, like grilled zucchini, chopped lettuce, or olives. You could even marinate extra firm tofu, instead of chicken, if you want to make these vegetarian tacos. I prefer to serve these tacos with corn tortillas, but flour tortillas would work great as well! 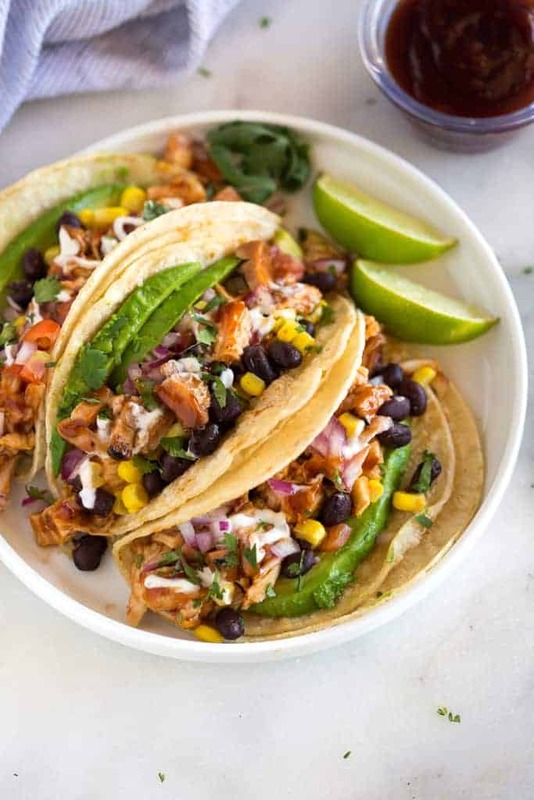 BBQ Chicken Tacos are marinated bbq chicken served in a warm tortilla topped with black beans, corn, onion, cilantro, avocado and a creamy cilantro lime sauce. Add chicken and 1/3 cup bbq sauce to a ziplock bag. Refrigerate for 1-3 hours. Make the creamy cilantro lime sauce by combining all ingredients until smooth. Refrigerate until ready to serve. Preheat grill and lightly grease with cooking spray. Add chicken and cook for 4-5 minutes on each side, flipping once, until cooked through (165 degrees F). Remove to a cutting board, baste with more BBQ sauce, and allow to rest for 5 minutes before chopping. Warm tortillas on grill or in a hot skillet. Add a spoonful of chopped chicken, corn, black beans, tomatoes and avocado to each warm tortilla. Drizzle with extra bbq sauce, and cilantro lime sauce. Garnish with fresh cilantro. Enjoy! Summer means grilling, but we are guilty of always doing the same things on the grill (hot dogs, burgers, chicken, etc.). This is such a fun twist to summer grilling! We like the tacos so much we made them for a family party…they were a huge hit! YUM! This comment is just for the Cilantro Lime sauce. 4 teaspoons salt in 1/2 cup greek yogurt? I thought that seemed like a lot so only added 2 teaspoons and had to throw it away. I started from scratch and only added a pinch of salt and it turned out much better. Thanks for catching the typo–I’m so sorry! Only a pinch of salt. Really a great and delicious recipe. Thanks for those instructions, my family just loved it I had already tried this with another way but because of your recipe its become delicious. My family did not like cilantro lime sauce last time I made it. Can you think of any other sauce that might be good on it? How about a drizzle of bbq sauce and ranch?